SO WHAT ARE YOU GUYS DRINKING TONIGHT? Southern Tier’s Un…oh, wait…you were serious. Wifey McHops and I split a bomber of Pretty Things Once Upon a Time Mild Ale courtesy of the Good Doctor. It was delightful. Now I’m drinking a glass of Elmer T. Lee on the rocks. I expect to be asleep before 10pm. Oskar Blues Mama’s Little Yellow Pils. In a tall pilsner glass. Watching Bruins/Sabres Double OT. Mr. Sixpack are you sure that’s not Brother Barley’s Fridge? Martini, Bridgeport IPA X 2, half a bottle of Red Diamond Cab Sauv (delicious Columbia Valley WA wine) with Pasta and italian sausage sauce. I know, I know, I should have had more beers, but Tues-Fri-Sat are my session beer nights. Also what’s the story on Terrapin? Never had their beer since I’m so far west…and it is not readily apparent why they have named their brewery Terrapin…Maryland grads? 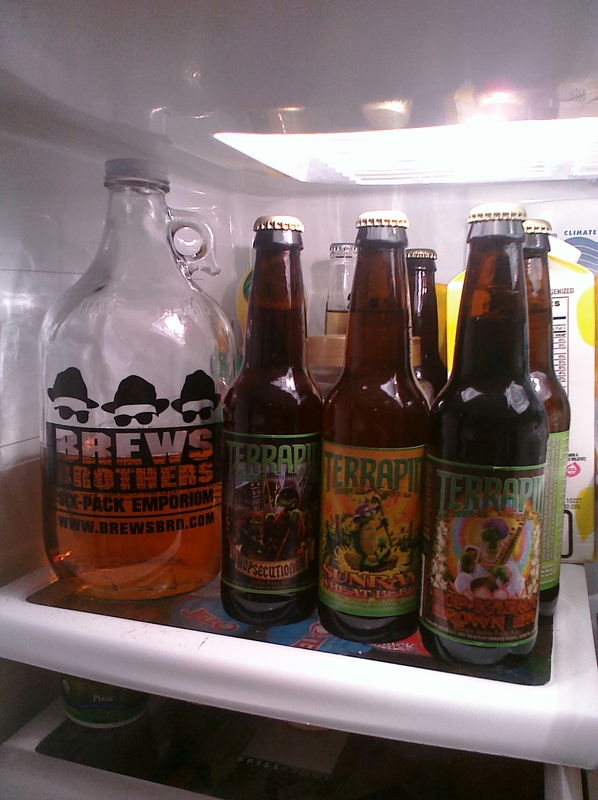 In any case, everytime you mention that beer I hear Terrapin station playing in the background and taste resin…. I also did a six-pack of Tasting Notes on some of their Monster Tour Series brews. Next Post MIKKELLER IT’S ALRIGHT!